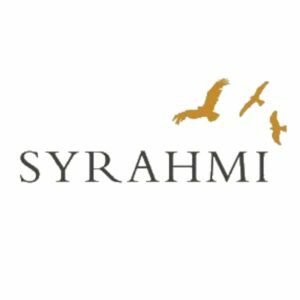 Lets have another look at how our wine makers in Australia manipulate and tinker with another wonderful Noble grape variety. 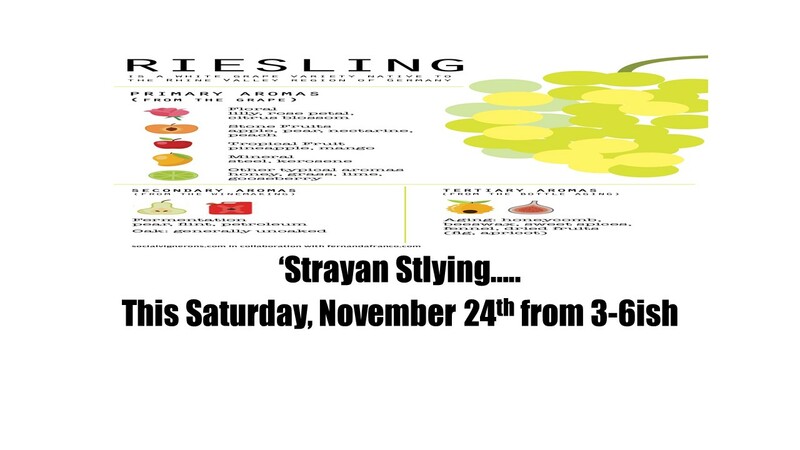 This week we will look at Riesling – ‘Strayan Style. In virtually every growing region in Australia you will invariably find Riesling planted, yet with each different region you will again invariably see vastly different styles and guises of this grape due to altitude, soil, temperature and whether or not irrigation is used. And all this amounts to what we think at the WINE STORE | WINE BAR as Australia’s true expression on how terroir is viewed. 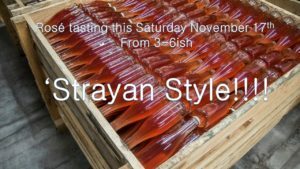 So make sure you pop through this Saturday, November 24th from 3-6ish and have a look at the many different interpretations of this wonderful variety that we grow and make here. It certainly is that time of the year when the go-to wine in the fridge – or the chilli bin – is definitely a Rosé, or Rosie as we like to call them here. Now we all know that the French make some pretty ACE Rosies and they are pretty much the benchmark for all Rosies. But we here in Australia also make some pretty smoking hot Rosies too, so this Saturday we will be opening about 7even ‘Strayan Style Rosie’s for you all to have a wee look at and see how we do it here. 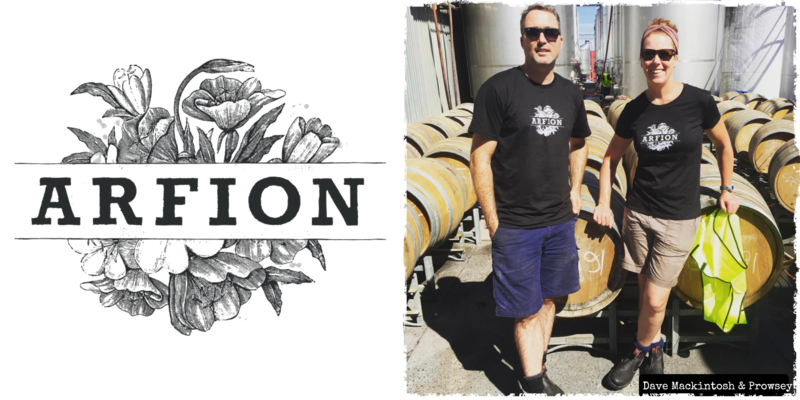 With another Saturday comes another Meet The Maker Sessions with this Saturday to be hosted by Dom Valentine of Valentine Wines. Dom’s wine journey started in 2010 while working in Rudesheim and Geisenheim in Germany’s Rheingau region. 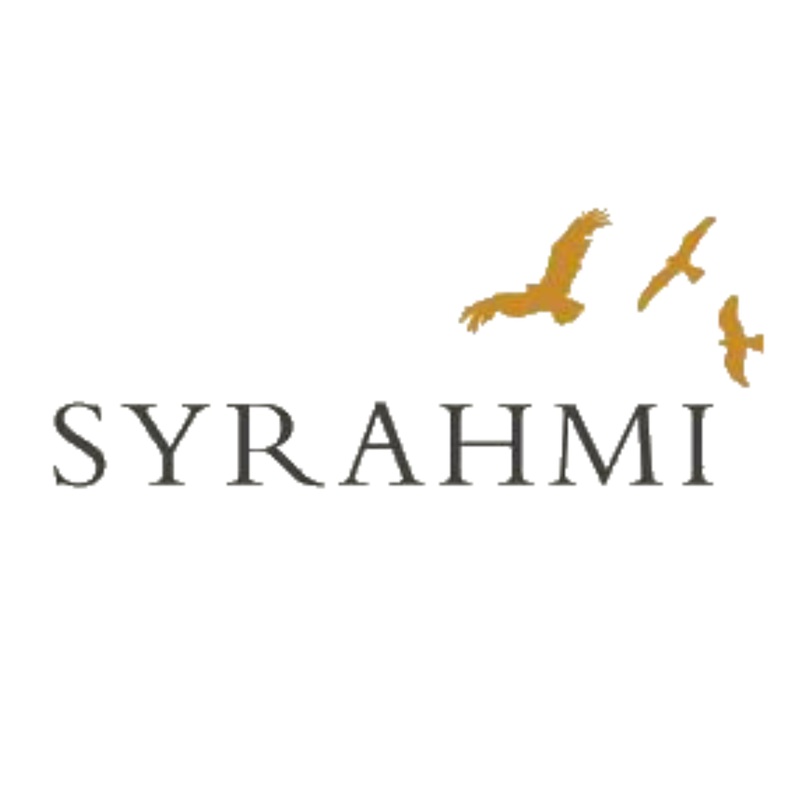 In that year, Dom worked for both both Weingut Josef Leitz and Weingut Georg Breuer – two of the region’s most respected producers. 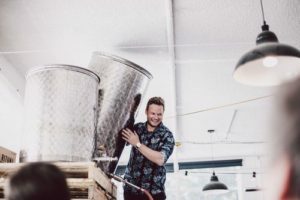 Each of those experiences was inspiration to return to Australia and pursue his Valere project whereby he sourced grapes each year from a different vineyard in Victoria to explore the lessons learned in Germany. 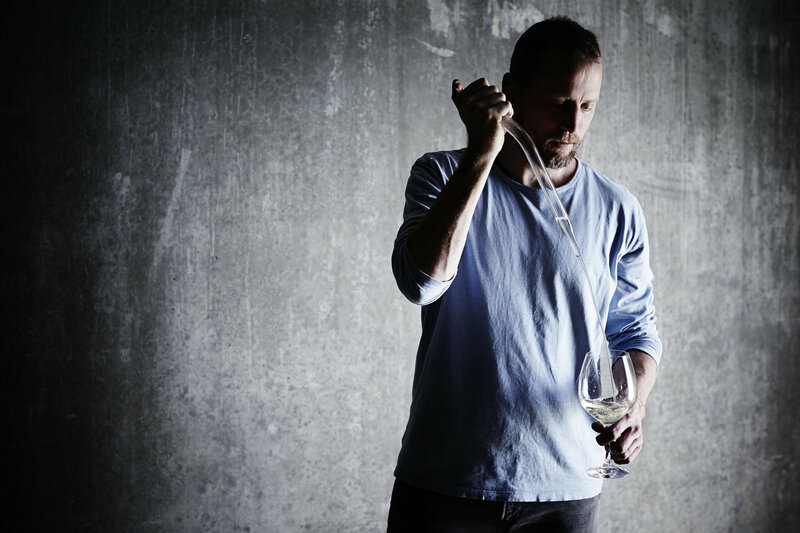 Fast forward some years and Dom has added a deliciously perfumed Heathcote Grenache and a wildly ace Chardonnay from Victoria’s highest altitude vineyard in Whitlands in the NE of Victoria. Both wines add to Dom’s unmistakable light touch when it comes to producing wines that have true terroir expressions. So as Molly would say, do yourself a favour and swing on by the WINE STORE | WINE BAR this Saturday, October 27th from 3-6ish and have a gander of three of our fave wines for 2018. The WINE STORE | WINE BAR is turning 4 on October 15th, so to mark this milestone of of the stores fave winemakers, and one of my best mates, Michael Dhillon of Bindi Wines in for a tasting. As many of you will know, Bindi Wines, and Michael who is effectively Bindi, have a very special place in my heart. And it is because of this Michael will be in the WINE STORE | WINE BAR on Saturday, October 13th from 1-4ish where he will pour his new release wines at the tasting bench. Bindi’, 50 kilometres north-west of Melbourne in the Macedon Ranges, is the family property of the Dhillon family. Originally purchased in the 1950s as part of the larger grazing farm ‘Bundaleer’, ‘Bindi’ is a 170 hectare farm of which 7 hectares are planted to Chardonnay and Pinot Noir. Fifteen hectares are dedicated to managed plantation eucalypts for high grade furniture timber whilst the remainder of the land is maintained as remnant bush land and important indigenous grasslands. The Bindi vineyard is the fundamental focus of the Dhillon family endeavors. The vineyard and winemaking philosophy is to seek balance and purity in the expression of the various individual vineyard sites and this philosophy is applied to farming and conservation at ‘Bindi’; the preservation of the natural harmony. This tasting is going to be popular so the earlier the better we would advise. 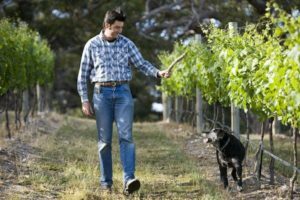 On tasting will be Bindi’s new releases which include all of the estate wines – Block 5, Original Vineyard and Dixon Pinot Noirs; Quartz and Kostas Rind Chardonnays and the Pyrette Shiraz from Heathcote. And what better way to celebrate our 4th anniversary then to have Michael pouring his wines. And there may also be a sausage sizzle out the back weather permitting. If you happen to be peeping out your window today you will swear that Spring is REALLY here. Though being Melbourne, this picture can quickly change. One thing that does not change however is the gorgeous fresh vitality That Reed Wines express. And what a coincidence, Sierra Reed will be the latest friend of the WINE STORE | WINE BAR to take part in our “Meet The Maker Wine Sessions” this coming Saturday, September 8th from 3-6ish. Reed Wines are single vineyard expressions made by Sierra Reed in Victoria. 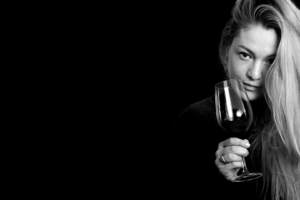 Always an inquisitive and enthusiastic drinker, Sierra’s journey in wine began in New Zealand whilst filming with the Family of Twelve. Interviewing those leading families of New Zealand wine inspired her to change her life and begin the journey from drinker to maker. A complete immersion in winemaking followed with a rapid succession of vintages as a global nomad in Paso Robles (Hearst Ranch Winery), the Yarra Valley (Domain Chandon), the Napa Valley (Piña), Central Otago (Rippon), Beaujolais, France (Domaine du Vissoux), the Grampians (Mount Langi Ghiran), Barolo, Italy (E. Pira & Figli – Chiara Boschis) Geelong (Lethbridge Wines), and Rheingau, Germany (Robert Weil). As well as 4 vintages under her own label Reed Wines of which she makes a Grenache, Shiraz, Nebbiolo and Riesling. Her main focus is Victoria as a region, but the Grenache is sourced from the Barossa from a very old vineyard and it’s a perfect fit for Reed Wines. It’s that time of the year again where all of the wine makers are back from Bali getting their hair braided and getting back to work. That means another season of our “Meet the Maker Wine Sessions”. And what better producer to kick the new season off than Alex Byrne (one of the Wine Stores best mates too-boot) of Byrne Wines and Liquid Rock n’ Roll. Alex studied Wine Science at Deakin and Charles Sturt Universities while continuing to work in retail wine sales as well as working vintages in Margaret River and the Northern Rhone Valley while studying. 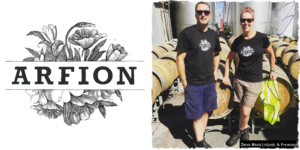 In 2013 he and his friend Kim Farrell formed Liquid Rock n Roll wines in order to experiment with different styles of wine. 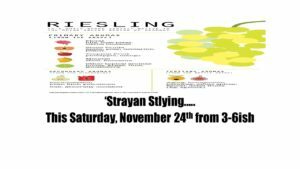 So make sure you swing on by the WINE STORE | WINE BAR this Saturday from 3-6ish and have a wee sip of some of the stores fave wines.